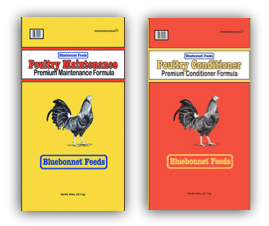 Argyle Feed & Hardware now offers Bluebonnet Feeds’ equine and poultry feed products. These superior quality feed formulations ensure the nutritional health and performance of animals to put them at the top of their class. 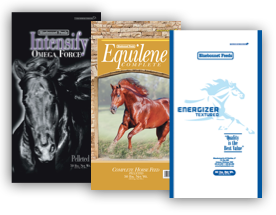 Designed for safe growth, performance, breeding, and maintenance horses of all ages. Contain specific ingredients to support gastrointestinal health which may reduce the chances of colic, ulcers, and pH imbalances. Formulated with reduced carbohydrate levels and elevated levels of fat from “Cool Energy” calorie sources. Available in Pelleted, Textured, Senior Therapy, Growth & Development, Omega Force, Total Advantage and X-Factor Low Starch. Provides balanced levels of vitamins, minerals, and other nutrients needed for maintaining a healthy horse. Formulated with premium vegetable oils, high levels of lysine which reflect high quality protein sources, and added prebiotics and probiotics which have been shown to improve the gastrointestinal health of horses. Available in pelleted or textured form, with specialized products also available: Equilene Complete for and Equilene Track Master. This is a high quality pelleted and textured feed for adult horses in all life stages. Formulated to help meet and maintain the nutritional requirements of adult game poultry, show birds and pigeons for top quality performance and condition. Fortified with protein, energy, vitamins and minerals to help ensure the ultimate conditioning and fortitude. Select balanced combination of high quality polished and triple cleaned grains, prebiotics, probiotics, minerals, vitamins and other important nutrients. Formulated for game poultry and fortified with protein, energy, vitamins and minerals to ensure the ultimate conditioning and fortitude. Visit us today at Argyle Feed & Hardware to learn more about the benefits of feeding Bluebonnet Feeds to your horses, poultry and game birds. We are your Denton County destination for all of your horse and poultry livestock needs. This entry was posted on Friday, January 1st, 2016 at 5:00 am	and is filed under Chicks, Horse, News & Updates. You can follow any responses to this entry through the RSS 2.0 feed. Both comments and pings are currently closed.